As many of you know, my blog is usually focused on classical music and music education but just occasionally I like to shake things up a little and go off piste. Today’s blog is dedicated to a wonderful jazz musician. 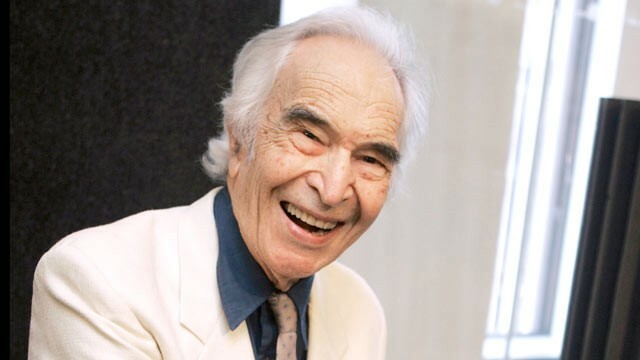 I was very sorry to hear of the death yesterday of Dave Brubeck. He died aged 91 just one day short of his 92nd birthday. Brubeck has inspired generations of musicians during his many years in the industry. I had the pleasure of attending his 85th birthday concert at the Barbican with my parents (who have both been avid Brubeck fans since the 1950s) where he performed many favourite numbers surrounded by his family who increasingly became part of his music making and concertizing. Even at this ripe old age, he was on sparkling form, still leaping around the keyboard demonstrating plenty of pyrotechnics during his many impressive improvisations. Born in Concord, California, Brubeck received his first piano lessons from his mother, who was herself an aspiring concert pianist and had studied with legendary British pianist, Myra Hess. Brubeck intended to be a rancher (like his father) and studied veterinary science at the College of the Pacific but quickly realised this was not his destiny and swiftly began studying music seriously taking lessons from Darius Milhaud and Arnold Schoenberg. Brubeck met saxophonist Paul Desmond whilst serving in the military in 1944 and in 1951 formed The Dave Brubeck Quartet with Joe Morello on drums and Eugene Wright on bass. Brubeck always considered himself “a composer who plays the piano” and his experimentation with unusual time signatures, which at first was thought to be rather idiosyncratic to say the least, became his trademark. The Quartet achieved rock star status with a series of iconic numbers from their album Time Out (released in 1959) which became the first million selling jazz album subsequently introducing a whole new generation to jazz. Blue Rondo á la Turk, Three to get Ready and Pick up Sticks were all popular but it was Take Five that became the biggest selling jazz single of all time. Brubeck experimented with time signatures like 9/8 and 5/4 which gave a striking and unfamiliar feel to his music. Take Five was apparently inspired by a pattern Morello used to play backstage and Desmond added the famous melody over the top. I, like many others, love this work (I played it regularly in my cabaret show) and found the unexpected rhythmic pattern great fun to play. Brubeck continued to write in many different genres always interweaving jazz with classical music; he wrote solo piano works, string quartets, orchestral works, and a cantata. He toured frequently almost until his death, performing for many presidents and dignitaries, and he received countless awards and accolades for his outstanding contribution to music. A nice posting Mel. I have shared it on Facebook.